From left, Jake Levine, Willy Hogan, Coach Alisa Cairns, Ryan Meisberger, Anika Pitz, Cayla Henderson, Wesley Eagleton, Zach Levine, Noah North, and Tobie Grierson. Photo by Lorie Levine. 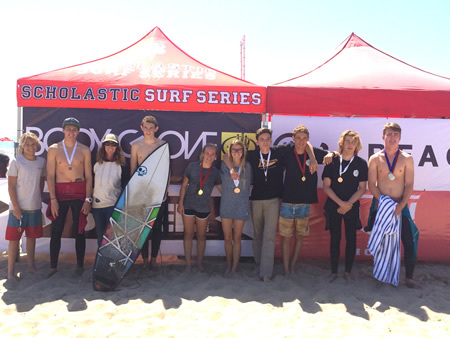 Laguna Beach High School was the big standout in the Scholastic Surf Series fifth and final event of the season, held Saturday, March 21, at the Huntington Beach Pier. Students took wins in each division and almost every spot in the various division finals. The competition included St. Margaret’s, J. Serra, Rancho Santa Margarita and El Toro. The two to three foot surf throughout the day seemed to improve for the boys shortboard final. The bodyboard final was first up, with Spencer Davis winning first. Our girls did double duty competing in both the longboard and shortboard finals. Anika Pitz had a huge day winning both divisions, while Cayla Henderson also took sixth in longboard and fifth in shortboard. The LBHS boys shortboard team stole the show with five out of six making it to the finals. In the nearly all Laguna final, the boys battled hard against each other and traded wave for wave close to the pier. When the horn blew to finish, Zach Levin took first. The goofy footed surfer had several nice vertical frontside hits and a number of good rides, including shooting through the pier. He was followed closely by Tobie Grierson in second, Willy Hogan in fourth, and Noah North and Jake Levine in fifth and sixth. In the longboard, Tobie Grierson took first, Ryan Meisberger third and Wesley Eagleton sixth. 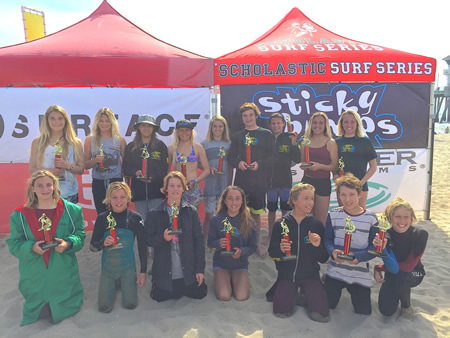 The Thurston Surf Team also competed at the Huntington Beach Pier, but on Sunday, March 22, and placed second to San Clemente’s Shore Cliffs team. Sixteen Thurston surfers coached by Jeff Booth, Bobby Lockhart and Chris Williams made the finals. Highlights included Kayla Coscino and Liv Stokes taking first in the short and long board divisions respectively. Front row from left: Lola Fisher, Luke Smialowicz, Gaal Shonefeld, Isabella Petersen, Travis Booth, Jamison Roller, and Ryan MaGee; back row, Liv Stokes, Claire Kelly, Tess Booth, Kayla Coscino, Alex Wick, Cole Fink, Liam McCue, Grace Fink, and Kelly Smith. Boys long board: Jamison Roller, 3rd. Girls short board: Kayla Coscino, 1st; Kelly Smith, 3rd; Claire Kelly, 5th. Girls long board: Liv Stokes, 1st; Lola Fisher, 5th. Boys short board: Ryan Magee, 3rd; Luke Smialowicz, 4th. Boys long board: Gaal Shonefeld, 5th; Alex Wick, 6th. Girls short board: Tess Booth, 2nd; Isabella Peterson, 3rd. Girls long board: Grace Fink, 2nd.